Each Season at London Fashion Week the British Fashion Council gives a spot light to British Miliners at the Headonsim exhibiton rooms. 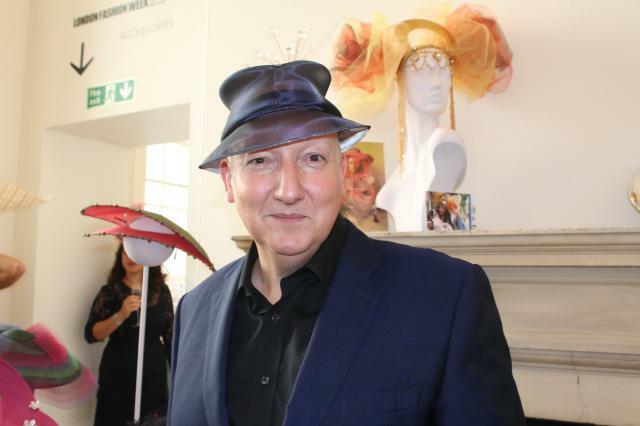 We are blessed with many talented Milliners in this country and under the Stephen Jones OBE works closely with the BFC supporting and promoting this vital part of our fashion industry. Stephen Jones lives and breathes his craft and he is committed to growing the presence of this most traditional of British Crafts. For Spring Summer 2015 Stephen joined up with illustrious china producers Wedgwood forming a partnership of two of the strongest traditional British crafts who's reputations ring around the world. 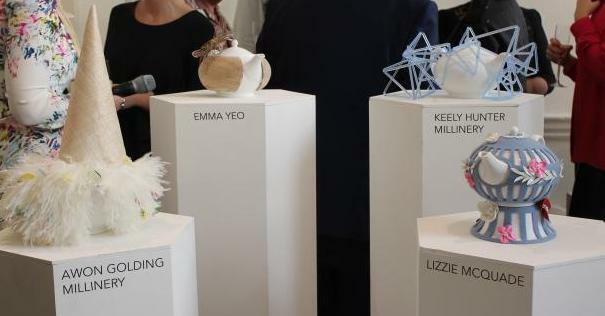 Together Stephen and Wedgwood came up with a great working project to showcase young designers - PROJECT TEA COSY. This played on the old joke of hats and tea cosy's being interchangeable and I think it's a great idea. Also there is a simple synergy 'what the hat is t the head, the Tea Cosy is to the Tea Pot'. It's fun and was a great launchpad for a great group pf young designers to showcase their designs. Stephen has curated Headonism since it's inception at London Fashion Week in 2009 when it was launched by London Mayor Boris Johnson. This season the four designers in the frame where Awon Golding, Emma Yeo, Keely Hunter and Lizzie McQuade. It was good to catch up again with Stephen and I really enjoyed hearing him talk about the genesis of this idea. Put simply millinery is one of best known areas of British fashion and we Brits are well known for our love of hats. Put that together with Wedgwood china, known throughout the world and you have something very special. Stephen had a great diversity of millinery on offer to his clients and here at the bi-annual showcase he brought some of his collection and inspirations for Spring and Summer 2015. starting above to the left I was very taken with the delicate cloche hats in white that where in a variety of different designs. They would look great for spring and summer events and could be sneaked into a winter outfit possibly too. White is a pretty versatile colour and you can team these hats up with different outfits. I always find it fascinating to talk to Stephen, who I learned is also from the same corner of Cheshire originally that I grew up in although I can certainly never have claimed to have made such an impression in the field of arts that he has but it's good to meet someone who came from the same place with such drive and ambition. There really is a profusion of creativity here and I've enclosed close-ups of some of my favourite looks. Stephen really has created a world of millinery. His current season collection for winter 2014 blends the influences of both Greta Garbo and Naum Gabo. I would recommend visiting his store in Covent Garden at 36 Great Queen Street, Covent Garden, London WC2B 5AA. 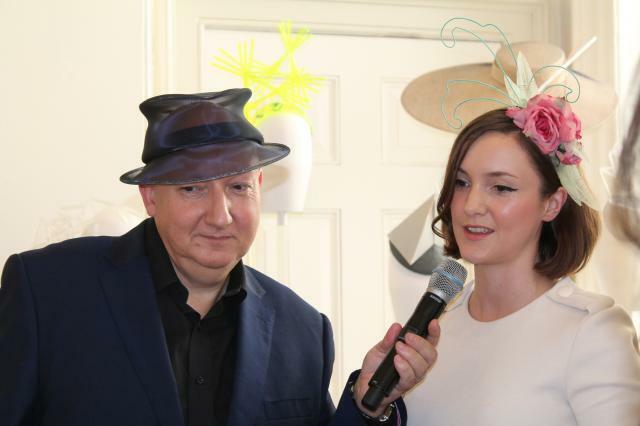 Piers Atkinson is one of the most charismatic milliners that we have. He's a fantastic person as well as a super-talented designer and he's really great fun to talk to. I recommend checking out his website and his collections. Here is a link to his web page piersatkinson.com and you can follow him on twitter @piersatkinson. As you'll see he's always getting involved in great collaborative projects with other designers and has boundless energy and enthusiasm. 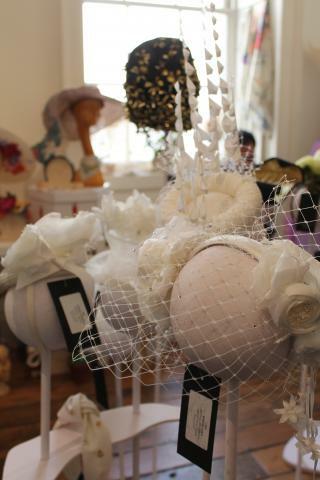 Here below are some of the hats from his SS15 collection, 'The Garden of Earthly Delight'. Light, feminine and delicate; there are a broad range of styles here that will suit all tastes for many different occasions. Piers press is handled by Elle Dror PR. Hat wearing, as these guys can tell you, has a lot to do with confidence and exploring your personality. Hats can suit people who want to be a bit more mysterious and at also they lend themselves well to people wanting to show the power of their confidence. This collection of earthly delights will make a lot of hat buyers happy I think next year. There are definitely a couple that I would chose for occasion ware next year for the races or a wedding and they are styles that will serve you on good stead in future years. There's lots of fun and some serious top notch craftsmanship here. Brand Ambassador Julia from Wedgwood. Piers is here above beaming away with a cup afternoon tea served in a new current season design from Wedgwood china. The afternoon tea ritual that Wedgwood is by tradition a part of goes hand in hand with the world of millinery and the social occasions that hats have been traditionally worn at. But what now in the 21st century. Well, there is always time for tea and people with a taste for art and fashion will often also have an eye for design in many ways. The Wedgwood sets are little works of art in their own right and it's worth noting that two fashion designers Jasper Conran and Vera Wang currently collaborate with them to create china collections alongside their numerous fashion collection commitments. I have to add that as well as a great cup of delicious tea Wedgwood also served the most delicious afternoon scones with jam and cream as seem below on the cake stand. Really filling and just what you need when your eyes are devouring the detail of so many intricate designs. 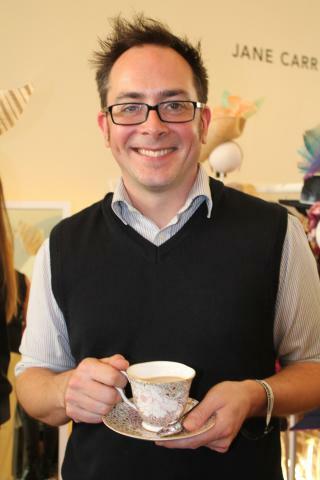 I met Scottish milliner William Chambers for the first time and really enjoyed our conversation. He spoke about being involved with the Headonism project and he talked me through his collection for Spring-Summer 2015 inspired by Scottish colourist JD Ferguson. 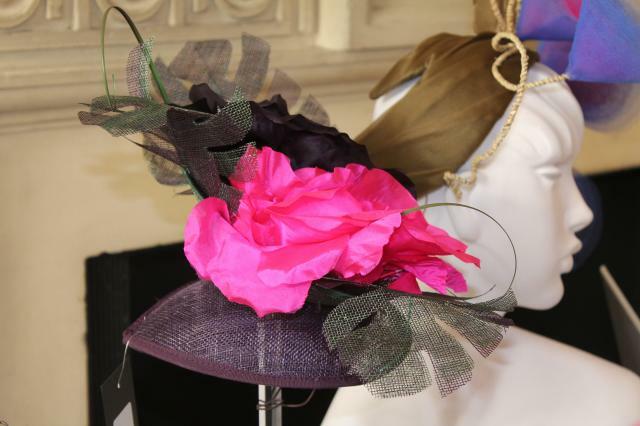 When you chose a design from William's collections you have the choice of using different colours and trimmings with the designs which makes it easy to bespoke a hat to match your outfits or your fancy. Above I've included a broad shot of the hats from the collection with two of my favourites placed either side. These are on the left, the Cut Silver Floral disc and to the right a Double Rose in Navy Blue. I urge you to look at Williams web site here to take in the full collection and see his past archive. It's very accessible. You can also follow him @williamhats on twitter. 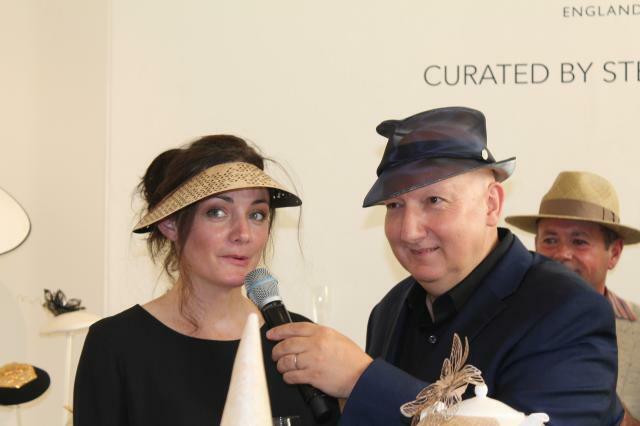 Please do as it's a great way to see what the millinery community are up to. Now based in London with a growing reputation she has been chosen to feature as part of the Headonism Schedule by Stephen and for this season and I think she's going to have an amazing career ahead of her. I really liked this tea cosy design and to be truthful it was my favourite of the one shown by the four designers - see below. I liked the way that the tea pot appeared to be dressed in a outfit which I thought was very fitting for Fashion Week in London. 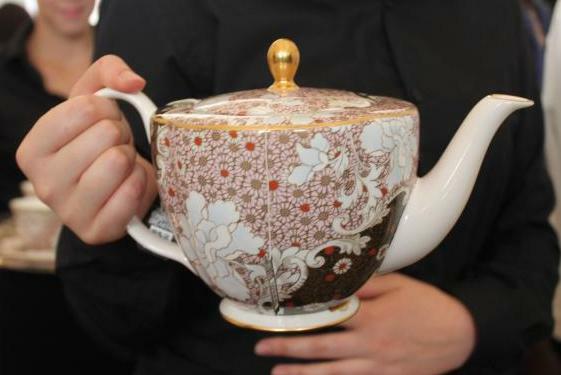 A classic Wedgwood teapot the perfect way to serve afternoon tea. Here are some looks from the Spring into Summer collection from Lizzie. They're very charming and I love the mix of fun sun hats and sweet headpieces. Lizzie designs for the discerning and romantic woman and I can see and feel this when looking at her collection. I strongly encourage you to look at her web page here and see her progress to date. Here are the four designs created by Emma Yeo, Keely Hunter, Awon Golding and of course Lizzie. Emma is below to the right with Stephen, wearing on of her own designs and talking about her inspiration for the piece she created. like all of the designers she has a great respect for Wedgwood and grateful for their support and enthusiasm for supporting Headonism. Below to the left is the lovely Awon Golding. A former fashion Editor in Hong Kong she draws some of her inspiration from a globe trotting up bringing between Hong Kong, India and the UK. Now a designer herself with a growing brand she like Lizzie also creates two collections a year and it's a delight to see her on the London schedule. Awon cites her craft as "using traditional materials with couture skills combined with a fresh, modern design aesthetic". 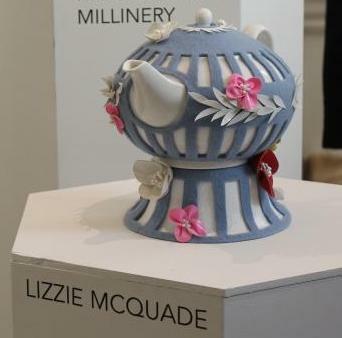 Sally Warmington, Marketing Director EMEA commented: "Wedgwood has a long tradition of supporting, encouraging and inspiring creative talent. 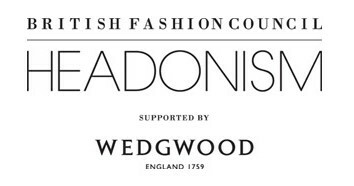 We are proud to be the sponsor of Headonism and look forward to sharing the Wedgwood heritage of craftsmanship and design with this talented collective of British milliners. 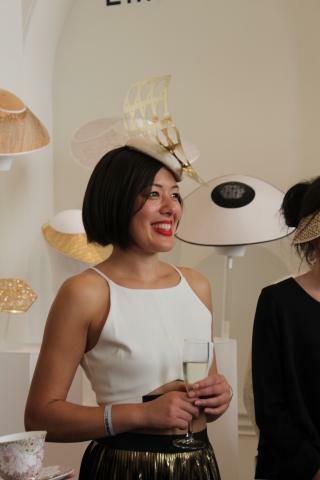 As host for the event Stephen introduced the four up and coming milliners who where showcasing. Here below is Lizzie McQuade, also from Scotland, speaking with Stephen about her design and her inspiration. I think you can see the continuation of her floral theme for Spring - Summer 2015.